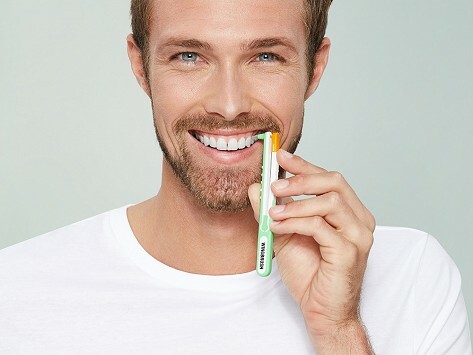 WINGBRUSH interdental cleaner gets into tight spots between teeth that a traditional toothbrush can't reach. The brush’s two-part design of a feeler and bristle head make the deep-cleaning process quicker and easier. It’s an especially effective method if you have braces or bridgework. A brush head lasts for about a week of cleaning and there are different sizes to best suit your smile. Dimensions: 5" x 1" x 0.25"
I love this brush. It is so easy to use and more effective, I think, than floss. Meets a REAL need--no gimmick! With the retirement of my OLD dentist, I was forced for the first time to take an outside opinion, and it was not at all good. Flossing wasFlossing was an art that I never could master, but these brushes on spring wire in various sizes made me master of my interdental spacers, and the result was a rapid turn-around in my checkups. Tight spots between teeth can benefit from an interdental cleaner, but the task of using one can seem daunting and time-consuming. So Dr. Louis Balhmann created his own cleaning tool for teeth that makes the process easier so people would actually use it. This deeper-cleaning method is like flossing but better. It’s an especially great way to clean if you have braces or bridge work. WINGBRUSH gets into spaces that a toothbrush can’t reach to make sure teeth are as clean as can be. It is made up of two parts: a guided brush and a feeler. This design helps line the brush up with gaps between teeth, and helps prevent unwanted pokes, too. It takes a few tries to get used to using the brush, but once you experience the ultra-clean feeling it delivers, we think you’ll happily add it to your routine.